Pop quiz: what do these cities have in common? These cities have joined a coalition of 54 cities, counties, and mayors to file an amicus, or “friend of the court,”brief to support the Clean Power Plan — our nation’s first-ever standards to limit dangerous carbon pollution from power plants – against litigation brought by some of our nation’s largest polluters and their allies. These 54 cities joined six additional major municipalities that filed in support of the Clean Power Plan as intervenors in the case. In total, sixty municipalities are on record supporting the Clean Power Plan as sensible, cost-effective clean air measures that will deploy innovative climate solutions and protect millions of Americans from adverse impacts. It’s yet another example showing that support for the Clean Power Plan covers our whole country. Power companies, state and local officials in forty-one states are also supporting the Clean Power Plan in court – either through their attorney general’s office, a local power company, or a municipality. 18 states, the District of Columbia, 60 municipalities and 11 utilities have filed in support of the Clean Power Plan. All generating assets were identified from company websites. The extensive coalition of cities is defending the Clean Power Plan because cities are the first responders when it comes to addressing climate change impacts — and these communities are already getting hit hard, along with many others across the country. Seven Florida cities, including Miami, highlighted how sea level rise is taking a grim toll on their welfare — including hundreds of millions of dollars being spent now on protecting critical infrastructure, and the creation of a long-term threat to drinking water supplies and insurance availability. Other coastal cities, including Houston, Baltimore, and Jersey City, experienced billions of dollars in damage from enormous, destructive storm surges caused by superstorms like Hurricanes Ike, Isabel, Katrina, Rita, and Sandy. Western cities, including Fort Collins, Missoula, and Portland, emphasized how increased heat waves intensify and worsen dangerous, deadly wildfires. Dallas, Boulder County, and Madison each faced extraordinary, record-setting rainfalls that caused millions — or even billions — of dollars in property damage. These cities are doing what they can within their borders to act on climate. But they are calling on the court to uphold the Clean Power Plan because it provides a framework that can drive needed carbon pollution reductions in a sensible, flexible, cost-effective manner. The Clean Power Plan will also prevent an estimated3,600 premature deaths and 90,000 asthma attacks annually once it is fully implemented. Twenty-seven of the cities in the coalition supporting the Clean Power Plan are actually located in states with Attorneys General who are challenging the Clean Power Plan in court. They are fighting to protect the health and well-being of their citizens from the threat of climate change — while facing state officials who are actively undermining them. 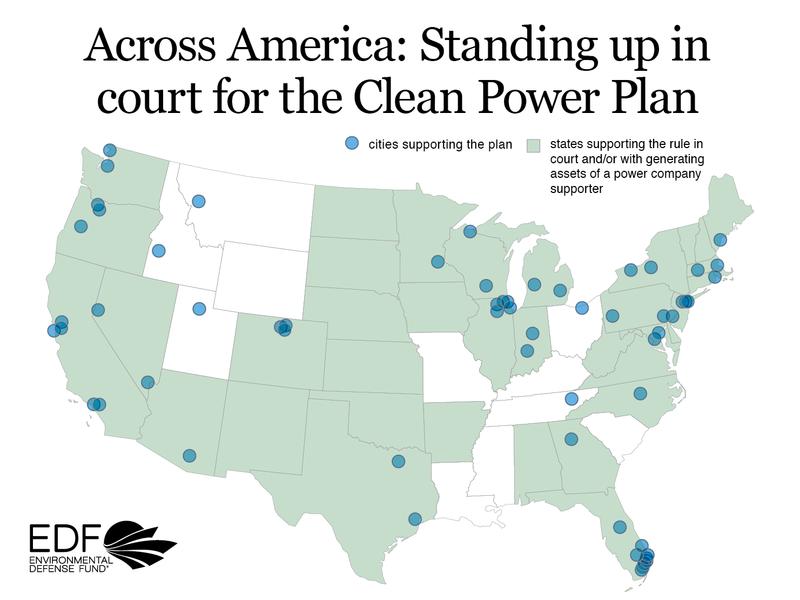 In addition to this far-reaching network of cities, a host of supporters are standing up in court for climate progress by highlighting the rock solid technical and legal foundation for the Clean Power Plan. The cities join our nation’s leading business innovators (including Google, Apple, Amazon, and Microsoft), leading legal experts, top health and medical experts (including the American Medical Association and American Academy of Pediatrics), leaders on consumer protections and the interests of low-income ratepayers (including Consumers Union and Public Citizen), more than 200 current and former members of Congress, and many others. They are all are part of the broad, diverse coalition that is supporting the Clean Power Plan in court. It’s yet another sign that Americans recognize the importance of securing a safe climate for our health, our economy – now and for the generations to come.